Home / Posts tagged "Anitha Balachandran"
An Icky, Yucky, Mucky April! Icky, Yucky, Mucky! goes to Hill Spring International School. Icky, Yucky, Mucky! 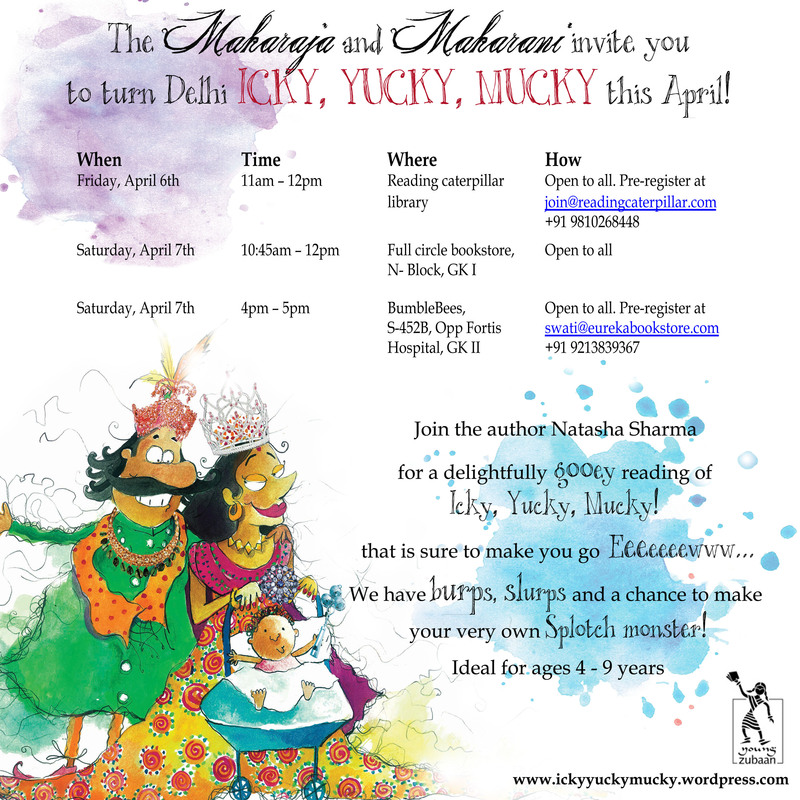 visited the wonderful library at Hill Spring International School for a dramatised reading by Natasha Sharma, author of the deliciously gooey story Icky, Yucky, Mucky! Kindergarten and grades I and II were in hysterics to see the well moustachioed Maharaja Icky slurping over the pickles, burping and juggling rosogullas. Natasha Sharma as Maharaja Icky had the kids enthralled. Their sporting librarian Ms. Soonawala, as Maharani Yucky, accompanied the Maharaja in his mess. This was one noisy library for two delightful mornings as it resounded with children laughing and shouting YUCKY! EEEEW! OOOH! NOOOO! Inspired by the wonderful splotches in the book created by Anitha Balachandran, the children then set about making Splotch Monsters. It was great to see much creativity emerging with Splotches with a dozen eyes, great big moustaches and even one demure little girl splotch. The library now has its very own Icky, Yucky, Mucky! wall. You can be a part of the Icky, Yucky, Mucky ride by visiting the ickiest blog with some deliciously icky recipes and wonderfully messy ideas. Also, join us on Facebook Icky, Yucky, Mucky! Page. 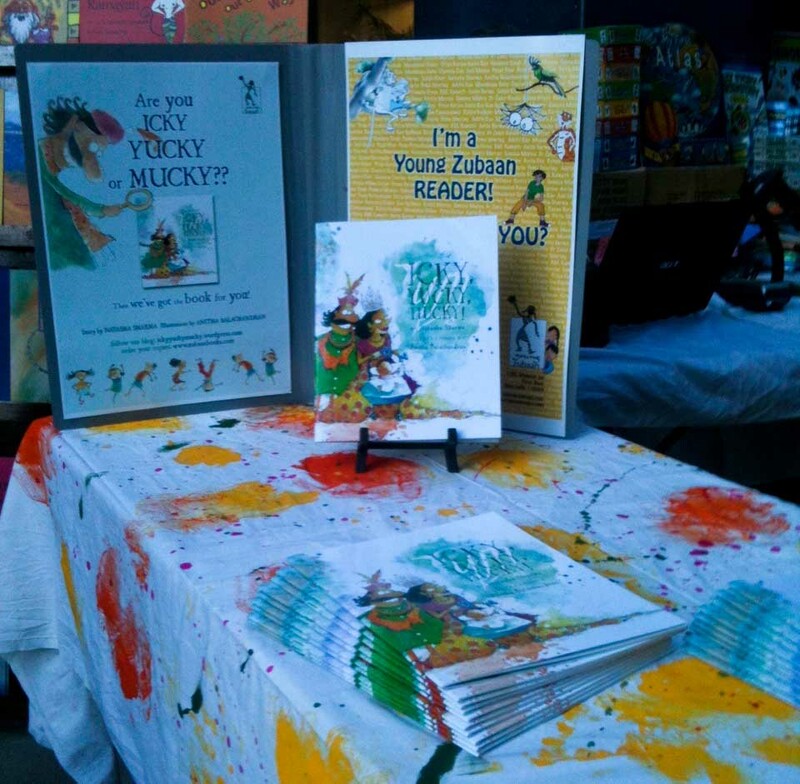 Young Zubaan at the DSC South Asian Literary Festival in London from the 7th to the 24th of October. We're really excited about the DSC Festival in London. This year, two of our Young Zubaan titles will be featured at the festival. Anitha Balachandran's exquisitely illustrated, "Mr Jeejeebhoy and the Birds" and Tabish Khair's magical story, "The Glum Peacock". Please do check it out if you happen to be in London. Copies of both books will be available on sale. If you can't, do check out the books either way, they're lovely.